Military personnel are at high risk for noise-induced hearing loss due to the unprecedented proportion of blast-related acoustic trauma experienced during deployment from high-level impulsive and continuous noise (i.e., transportation vehicles, weaponry, blast-exposure). In fact, noise-induced hearing loss is the primary injury of United States Soldiers returning from Afghanistan and Iraq. Ear injuries, including tympanic membrane perforation, hearing loss, and tinnitus, greatly affect a Soldier’s hearing acuity and, as a result, reduce situational awareness and readiness. Hearing protection devices are accessible to military personnel; however, it has been noted that many troops forego the use of protection believing it may decrease circumstantial responsiveness during combat. Noise-induced hearing loss is highly associated with tinnitus, the experience of perceiving sound that is not produced by a source outside of the body. Chronic tinnitus causes functional impairment that may result in a tinnitus sufferer to seek help from an audiologist or other healthcare professional. Intervention and management are the only options for those individuals suffering from chronic tinnitus as there is no cure for this condition. Tinnitus affects every aspect of an individual’s life including sleep, daily tasks, relaxation, and conversation to name only a few. In 2011, the United States Government Accountability Office report on noise indicated that tinnitus was the most prevalent service-connected disability. The combination of noise-induced hearing loss and the perception of tinnitus could greatly impact a Soldier’s ability to rapidly and accurately process speech information under high-stress situations. The prevalence of hearing loss and tinnitus within the military population suggests that Soldier use of hearing protection is extremely important. The addition of hearing protection into reliable communication devices will increase the probability of use among Soldiers. Military communication devices using air and bone-conduction provide clear two-way audio communications through a headset and a microphone. 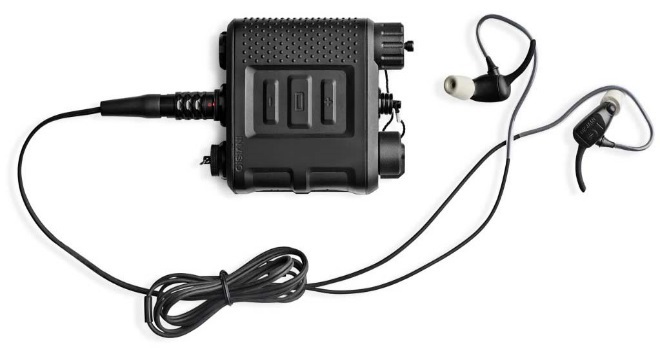 Air conduction headsets offer passive hearing protection from high ambient noise, and talk-through microphones allow the user to engage in face-to-face conversation and hear ambient environmental sounds, preserving situation awareness. Bone-conduction technology utilizes the bone-conduction pathway and presents auditory information differently than air-conduction devices (see Figure 1). Because headsets with bone conduction transducers do not cover the ears, they allow the user to hear the surrounding environment and the option to communicate over a radio network. Worn with or without hearing protection, bone conduction devices are inconspicuous and fit easily under the helmet. Bone conduction communication devices have been used in the past; however, as newer devices have been designed, they have not been widely adopted for military applications. Figure 1. 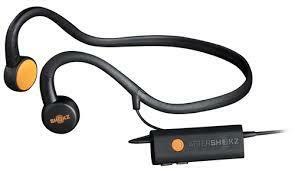 Air and Bone conduction headsets used during study: a) Invisio X5 dual in-ear headset and X50 control unit and b) Aftershockz Sports 2 headset. Since many military personnel operate in high noise environments and with some degree of noise induced hearing damage and/or tinnitus, it is important to understand how speech recognition performance might be altered as a function of headset use. This is an important subject to evaluate as there are two auditory pathways (i.e., air-conduction pathway and bone-conduction pathway) that are responsible for hearing perception. 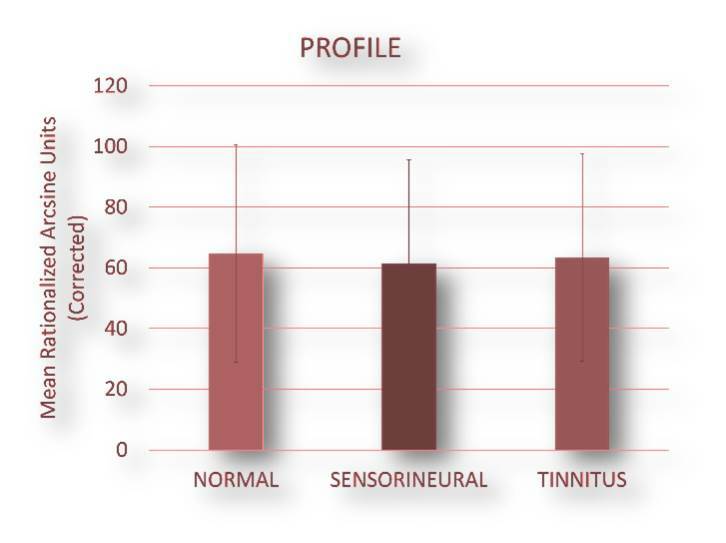 Comparing the differences between the air and bone-conduction devices on different hearing populations will help to describe the overall effects of not only hearing loss, an extremely common disability within the military population, but the effect of tinnitus on situational awareness as well. Additionally, if there are differences between the two types of headsets, this information will help to guide future communication device selection for each type of population (NH vs. SNHL vs. SNHL/Tinnitus). Based on findings from speech understanding in noise literature, communication devices do have a negative effect on speech intelligibility within the military population when noise is present. However, it is uncertain as to how hearing loss and/or tinnitus effects speech intelligibility and situational awareness under high-level noise environments. This study looked at speech recognition of words presented over AC and BC headsets and measured three groups of listeners: Normal Hearing, sensorineural hearing impaired, and/or tinnitus sufferers. Three levels of speech-to-noise (SNR=0,-6,-12) were created by embedding speech items in pink noise. Overall, performance was marginally, but significantly better for the Aftershockz bone conduction headset (Figure 2). As would be expected, performance increases as the speech to noise ratio increases (Figure 3). One of the most fascinating things about the data is that although the effect of hearing profile was significant, it was not practically so, the means for the Normal Hearing, Hearing Loss and Tinnitus groups were 65, 61, and 63, respectively (Figure 4). Nor was there any interaction with any of the other variables under test. One might conclude from the data that if the listener can control the level of presentation, the speech to noise ratio has about the same effect, regardless of hearing loss. 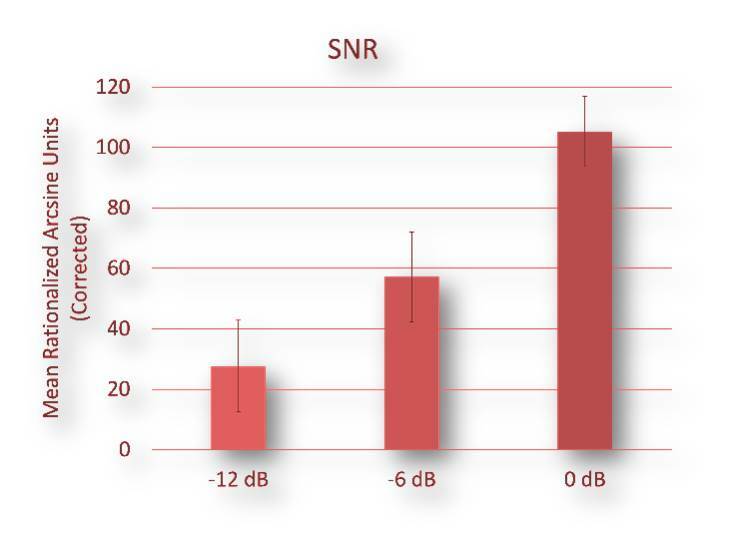 There was no difference in performance with the TCAPS due to one’s hearing profile; however, the Aftershockz headset provided better speech intelligibility for all listeners. Figure 2. Mean rationalized arcsine units measured for each of the TCAPS under test. Figure 3. Mean rationalized arcsine units measured as a function of speech to noise ratio. Figure 4. Mean rationalized arcsine units observed as a function of the hearing profile of the listener.